(1) The fatigue strength data given in 5.2 refer to high tensile mean stress conditions. 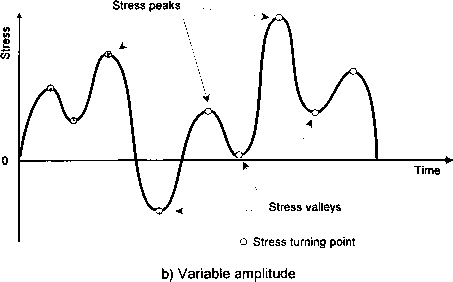 Where the mean stress is compressive or of low tensile value the fatigue life may be enhanced under certain conditions. See 5.3.2 to 5.3.6 and Annex G for further guidance. (1) Provided that the effects of tensile residual and lack of fit stresses are added to the applied stresses, the fatigue enhancement factor given in Annex G may be considered. a) Where tests have been conducted which represent the true final state of stress (including residual and lack of fit stresses) in the structure and demonstrate a consistent increase in fatigue strength with decreasing mean stress. b) Where improvement techniques are to be used which have been proven to result in residual compressive stresses and where the applied stress is not of such a magnitude that the compressive residual stresses will be reduced by yielding in service (see Annex E). (1)P No allowance shall be made for effect of mean stress without justification by test. (1)P In the endurance range between 103 and 105 a check shall be made that the design stress range does not result in a maximum tensile stress that exceeds the ULS design resistance for the detail (see Part 1 of this Prestandard). This possibility is indicated by Note 2 on figure 1.5.2..
(2) For certain details higher fatigue strengths may be used for negative R ratios for N<105 cycles (see Annex F). The method of obtaining the maximum, minimum and mean stress for individual cycles in a spectrum using the Reservoir counting method shall be as shown in Fig.4.5.1.